The U.S. is in the midst of a lingering nursing shortage that is impacting some parts of the country more severely than others. To ensure that patients have access to high quality care in their home communities, academic and practice leaders are working together to ensure a robust supply of nurses and nurse faculty. But where did this problem come from? And why is it so difficult to solve? To answer this question it is necessary to look at the problem from a few different angles. 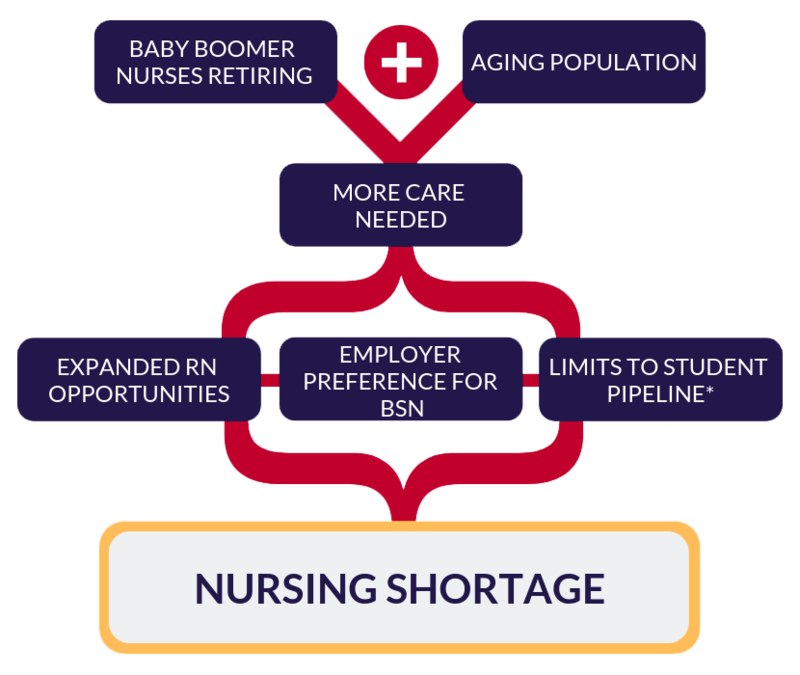 The first facet of the nursing shortage pertains to overall demographic trends in the U.S. Baby Boomers are aging, and as the largest generation (millennials are projected to take over as the largest generation in 2019), they will need more care than other segments of the population. This reality combined with a large proportion (over 50%) of nurses approaching retirement age means a shortfall would be difficult to curtail. In addition to meeting the care needs of older adults, the demand for Registered Nurses is increasing as new models of care are introduced, including a greater reliance on nurses to provide primary care. Further, employers today are also seeking new nurses with higher levels of entry-level education, which has created a shortage in the number of nurses needed with baccalaureate and higher degree preparation. The solution would be to inject more qualified nurses into the healthcare system. Problem solved, right? Unfortunately getting more nurses into the healthcare system comes with its own set of challenges. One of the primary obstacles to increasing the student pipeline into nursing is the shortage of nurse faculty. In 2017 AACN reported 1,565 faculty vacancies in a survey of 832 nursing schools. An insufficient faculty population combined with scarce resources means that there are too few admission slots for the number of qualified applicants. During the 2016-2017 academic year, nursing schools turned away 64,067 qualified applicants due to this perfect storm of circumstances. 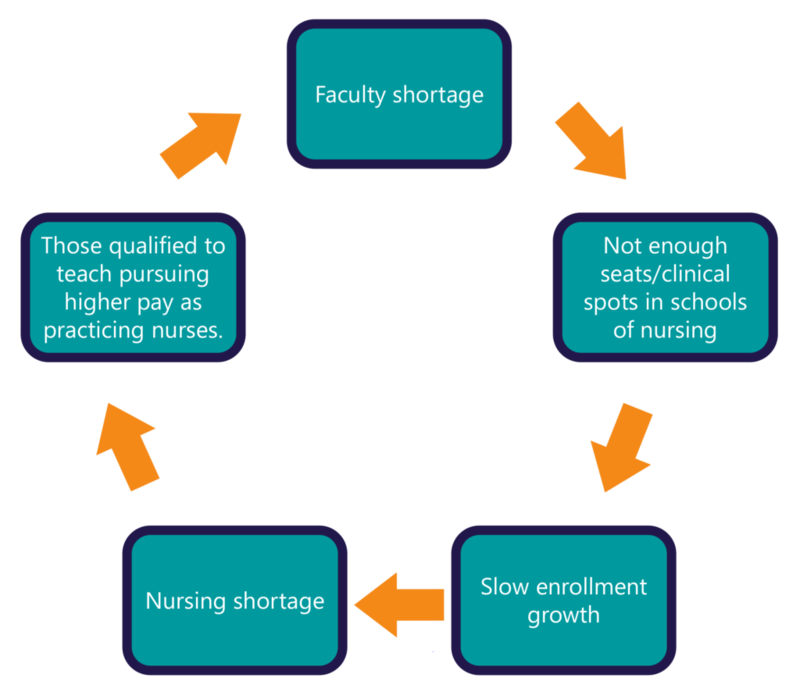 The lack of seats at schools of nursing means that schools experience slower than ideal enrollment growth, thus contributing further to the nursing shortage. As a result, we are left with a self-perpetuating cycle with no easy solutions. If you are applying to nursing school, it can be frustrating to continually hear about the nursing shortage given the challenges you may face when seeking admission into a nursing program. NursingCAS is a key initiative to help reduce the nursing shortage by serving as a much-needed mechanism to direct applicants to available seats. In addition to the ability to research programs using this service, applicants receive a monthly newsletter with information about open seats, deadline extensions, and new programs. NursingCAS is the bridge addressing the gap between qualified applicants turned away and vacant seats. Create a NursingCAS account today and explore the variety of nursing programs available to you.